The Gallery Room was added to our facilities in 2010. Being more intimate than the Sports Hall, is it perfect for exercise classes. It has a smooth wooden floor and an iPod controlled sound system. 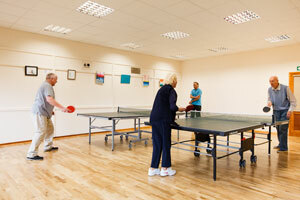 It is available to hire by instructors wishing to hold their own classes in the Sports Centre. The Gallery is also available to hold training sessions, meetings and other non-sporting activities. The Gallery Room is available for hire at the rate of £15.00 per 55 minutes. To enquire about hiring any of our facilities please e-mail us or call 01638 742125.